An acclaimed Christian Inspirational Series.All Candace had was her stunning voice.All he wanted was her downfall-and the loss of her faith.When she falls before thousands, will shame win?Sixty thousand people watched as Candace Rodriguez literally fell off the stage while performing the national anthem, wrecking more than her self-esteem. Is her music career over? Now, weighing 350 pounds and jilted by her fiancé after the shame of her public fall, can she find another chance at true love? Will her new Christian faith anchor her future hopes?Former highbrow stock trader, "JB" Patrickson has had enough of life making mockery of his best laid-out future plans. His father insisted he'd never make it more than selling " chickn" stock in Kentucky. Proving him wrong, JB succeeded at the NY Stock Exchange, becoming one of the best US traders...until the market crashed in 2008. Seven years later and mired in debt, he can't shake the urge that God is leading him down a different path. The path of accepting his grandmother's request to come help manage her farm, couple hundred miles away, despite his little to nothing knowledge about farming. Has he fallen low enough to toil with his hands to eke out a single meal? What future could God plan for him on a farm?Twenty years after returning to the US from a fulfilling medical mission in Asia, Dr. and Dr. Mrs. Cantwell gratefully send off two sons to college, purchase a flourishing twenty-acre farm, and prepare to settle into their empty nest stage. But what will they do if God leads one more life into their path, one needing stitches of the soul not of the body? Can they answer His call to service, or will overlooked pain from the past threaten the fragile peace they'd so desperately coaxed into existence to survive together?Find out how these lives intersect at the Day Spring Farms, and watch what God can do to turn brokenness and shattered dreams into masterpieces. 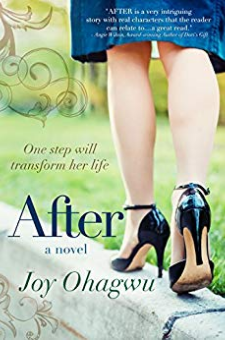 AFTER, an inspirational Novel by Contemporary Christian Fiction Author, Joy Ohagwu, is poised to spotlight the strength in transformation, courage in love and hope in times of despair.